Laser hair removal depends on a laser light to remove unwanted hair from the body. Hair removal will minimize the need to shave, wax, or pluck unwanted hairs. The laser uses intense heat to move through the skin to target the root, which is the hair follicle, below the skin to remove the unwanted hair. The hair follicle will be unable to grow new hairs once permanently destroyed. The average hair growth rate is about a half an inch per month. Typically hair grows in cycles between 8-10 weeks. The face normally grows in 4-week cycles, whereas the legs go through a longer cycle of new hair growth every 8-10 weeks. Which is why it is necessary to continue hair removal for several sessions and months. The hair must be in the growing (Anagen) stage for the laser treatments to work. This cycle is where the hair is visible on the surface of the skin. The laser will grab ahold of the live hair and move through it into the hair follicle making it the best time for successful laser hair removal. 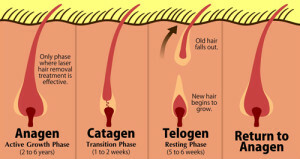 The Catagen cycle is the stage of the hair before it falls out naturally. This stage is not because of the laser hair removal treatment, but a natural stage hair goes through before falling out. The Telogen cycle is the final stage of the hair growth process. This is known as the resting stage where the hair is not growing or developing under the skin. The hair is not normally showing above the surface of the skin at this stage and therefor can’t be treated by laser hair removal. These cycles vary on the age of the person, hormones, and natural hair growth processes, resulting in individual differences. Each individual hair may be in a different hair growth cycle. Not all hairs beside each other will be in the same cycle making it important to target areas with the laser more than once. After the laser hair removal session, the hair bulb will start to come out over a 7-30-day period. This can cause redness and bumps like ingrown hairs, as your body will push the hair out of the follicle. Sometimes the hair is trapped under the skin, which is what causes the redness or bumps. It is common to think that the hair is growing, when it is really the body pushing the hair to the skins surface to remove. If hair growth does occur do not tweeze the hairs because then the hair will not be there to remove the next time. It is best to use cortisone on any red areas. The dead hairs can be manually exfoliated using a soft cotton and a circular buffing motion. If hairs still do not fall out it is best to wait until they are naturally expelled from the body, or you will cause further irritation. If you have any questions or concerns about the hair growth or falling out process please ask our aestheticians, as they are very knowledgeable in this area. The best suggestion is to be patient!